Flipkart Stops Delivering Items over INR 10000 in UP: What's the Real Reason? Flipkart Stops Delivering Items over INR 10000 in UP: What’s the Real Reason? I recently bought Nexus 4 via Flipkart. When I selected my address it told me that the item can’t be shipped to the desired address. I thought initially that this might be because of some issue with the phone or something of that order. Maybe Flipkart was only delivering it to major cities. I did not dwell over the matter much because living in NCR, I just got it delivered to my friend’s place who lives in Delhi. In fact, Flipkart has decided to altogether stop shipping any items in UP if they are above the price of Rs. 10000. I will be honest with you. The first thing that came to my mind when I read this is the meme of Dragon ball (Over 9000 one). Now, according to Flipkart it is a purely business oriented move. However, it is not difficult to gauge what might have caused this move to take place and that too for the most populous state of the country. According to Times of India, the ‘insiders’ are saying the main cause for this step was the number of orders that were ‘Cash on Delivery’ and were returned by the customers. These fake orders were made just for fun, due to which company was having a negative impact. A product would take 10 days to go to the customer and back to the company in case it was returned. This meant that the product was stuck in the pipeline and not sold for a span of 10 days. Alongside this, there are costs like transit and insurance which the company had to pay. What is the most interesting part is the move itself. It is a bold step and to take such a step simply means that the loss incurred by Flipkart must have outweighed the advantage of selling in the largest state of the nation. Taking this into mind we can imagine the amount of fake orders that must have been placed by people. What baffles me is that if this is the reason for Flipkart to skip the state then why did they not do this for only ‘Cash on Delivery’. The people who are paying by card have already paid the price so why not send them the products. This makes me feel that there must be more to the reasons for Flipkart to take such a huge step. Only time will tell if other companies follow suit or if Flipkart finds its revenue plummeting because of this. Flipkart has already decided to close its Flyte platform and with the entry of Amazon things are not going to be easy for Flipkart. As of now, if you want to buy anything from Flipkart above Rs. 10000 and you live in UP, you can’t. 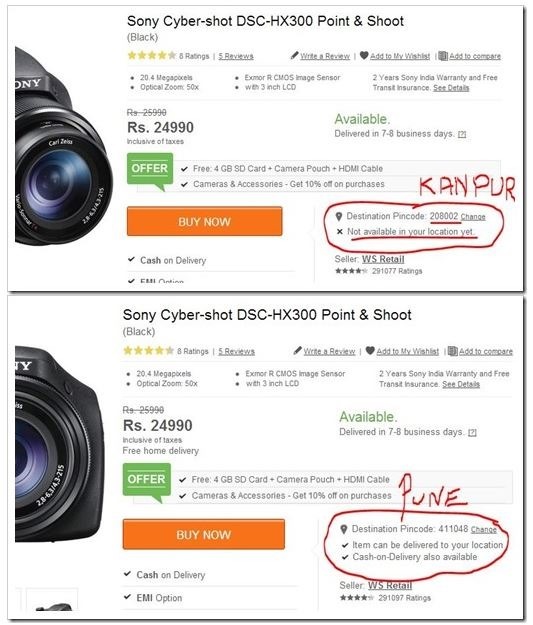 "Flipkart Stops Delivering Items over INR 10000 in UP: What's the Real Reason? ", 5 out of 5 based on 1 ratings. Shycart.com – A Personal Shopping Platform for Products You are Shy to Buy offline! Flipkart is facing some real competitions from the likes of global eCommerce firms like eBay and amazon…Amazon recently launched its own marketplace in India, and eBay invested a disclosed amount in Snapdeal…These two events make things more complicated for Flipkart….Flipkart needs to rethink and come up with a long lasting solution in order to survive it….Flipkart is putting some limitations from some of the states of the country….In fact its prices are higher than Amazon too…These won’t help at all…I hope it will understand it soon enough….